It turns from green to dull yellow to pinkish brown as it ripens. It looks like a misshapen papaya that can fit in a hand. And in its taste it is a cross between an orange and a custard apple. Those grown up in cities might not easily guess its name because monkey jack, known as badhal or barhal in northern India, was never popular in urban markets. Its high perishability ensured that the fruit, unlike its close cousins jackfruit, remained restricted to the regions in which it grew. But its pickle travelled to many households beyond villages and tribal settlements. Today this wild fruit is vanishing from even rural markets. 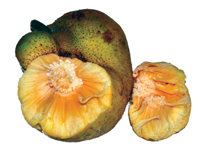 Badhal (Artocarpus lakoocha) is a native of India, specifically the sub-Himalayan region. Badhal trees have been an important part of traditional agroforestry. In the wild, they are found in moist and deciduous forests along the streams in India, Nepal, Bhutan, Bangladesh, Myanmar and Malay¬sia. Unlike jackfruit, all parts of badhal are edible. It is widely used in northern India for making pickle and vinegar preparations. Many families enjoy fermented unripe pieces of the fruit in vinegar, with garlic, mango and chillies added for a spicy touch. When ripe it is slightly sour and is mostly used for chutneys. A summer fruit, badhal is also sliced, dried and used as a substitute for tamarind. 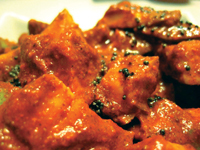 The dried slices impart a special flavour to meat and fish curries, particularly in west India, and are considered a counterbalance to oil. Traditionally, badhal fruits have been used for treating dysentery and arthritic swelling and cleaning wounds. Traditional healers used its bark to draw out poison from the body and its stem to expel tapeworms. Modern research is discovering more virtues of monkey jack. As per a 2008 study published in Glycoconjugate Journal a compound extracted from its seeds showed antiproliferative effects on human leukaemia cells. A 2005 article in Natural Products Research indicated that a component (oxyresveratrol) of badhal heartwood has potent anti-herpes simplex virus and anti-HIV agents. Even the vanity market finds it appealing. A few cosmetics companies are using parts of badhal to make skin-whitening creams. But this tree of several virtues is disappearing from many places, point out articles published by the horticulture department of Purdue University in 2009. It does not help that its seeds have poor viability. Take sliced badhal pieces and mix the spices in lukewarm mustard oil. Roast pinch of hing till fumes come out. Take a glass jar and let the fumes enter it. Mix sliced badhal in spice mixture and fill it in the bottle. Keep the jar in sunlight for the next 7-10 days till the pickle is ready. Mix all the spices, salt and mustard oil in sugarcane vinegar. Now put the sun-dried sliced badhal pieces, karonda, raw mango slices, peeled garlic cloves in the vinegar. Keep the mixture in sunlight for the next 7-10 days till the pickle is ready. Once the vinegar mix is ready you can put raw onion slices. Tastes best with daal chawal. Badhal is common in Allahabad. In Rural Kerala it is called Anjili. The fruit is delicious for its sweet and sour taste. The seeds are roasted and eaten. They taste like roasted chestnut. I remember this tree at my ancestral home in Karazhma, Mavelikara.